Aaron Judge about to touch home plate on his home run. @Yankees. The Yankees beat the Oakland A's, 7-2, on Wednesday night in the American League Wild Card Game at Yankee Stadium, led by home runs from Aaron Judge and Giancarlo Stanton. This sets up a matchup between the Yankees and the Boston Red Sox in the American League Division Series. This is the first time that the archrivals will meet in the playoffs since the epic 2004 A.L. Championship Series, in which Boston came back from 3-0 down to win the series in seven games and eventually win their first World Championship since 1918. Yankees starting pitcher Luis Severino set the tone in the top of the first, as he retired Oakland in order and racked up a couple of strikeouts. Oakland went with Liam Hendriks, who usually pitches in relief, to start, as they opted to "bullpen" the one-game playoff. In the bottom of the first, Andrew McCutchen, in the lead off spot for the Yankees just as he has been the last month of the regular season, started it off with a walk. 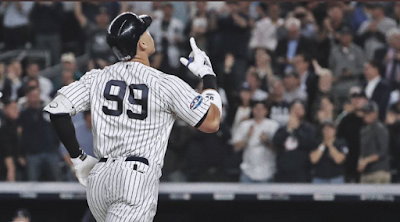 Aaron Judge was up next, and he hit an absolute bomb to left field, a 427-foot home run to make it 2-0 Yankees. Lou Trivino was first out of the Oakland bullpen for the second inning, and the Yankees had a golden opportunity to add to their lead. Didi Gregorius reached base on an infield single, followed by a Miguel Andujar walk, but Gary Sanchez hit into a double play and Gleyber Torres struck out to end the frame. Severino was sailing along until the fourth inning when Khris Davis reached base on an Andujar throwing error. He then walked Matt Olson, got Stephen Piscotty to fly out to right, and walked Ramon Laureano to load the bases. Trevor Semien had a chance to get Oakland on the board, but Severino struck him out to end the inning and send The Stadium into a frenzy. Oakland kept it going in the fifth, as Jonathan Lucroy and Nick Martini laced singles, and that was all for Severino, who left to a standing ovation. In came Dellin Betances, who usually pitches the eighth, for a very pivotal moment a bit earlier: two on base and none out in fifth. Bentances delivered, as he got Matt Chapman to fly out to right, Jed Lowrie to fly out to center, and Davis to strike out swinging. He then stayed on for the sixth and retired the A's in order. Oakland turned to veteran reliever Fernando Rodney in the sixth. Judge hit a double down the right field line, followed by a double up the gap in right field for Aaron Hicks that scored Judge and made it 3-0. After throwing one pitch in the dirt to Giancarlo Stanton that got away from Lucroy, that was it for Rodney. In came Blake Treinen, who walked Stanton, and then gave up a rocket to deep right from Luke Voit, a triple which scored Hicks and Stanton and made it 5-0. Gregorius hit a sacrifice fly to score Voit, who used an acrobatic slide to get around the throw at home plate and give the Yankees a big 6-0 edge. In the seventh, David Robertson was on to pitch for the Yankees, and Semien laced a rocket to third base, but Adeiny Hechavarria (who just entered as a defensive replacement) made the play of the night when he leaped straight up to snare the liner. The Yankees acquired Hechavarria in late August for his defensive abilities, and he proved it big time with that play. Another late August acquisition, McCutchen, followed that with a nice running catch to snare a Lucroy hit up the gap in left field. Robertson struck out Martini to close the seventh inning out, a perfect frame for a reliever who needed it. Oakland finally got on the board in the eighth when Davis hit a two-run homer off Zach Britton to make it 6-2, giving them some hope. That was extinguished in the bottom of the eighth when Stanton launched a 443-foot home run down the line in left that roped around the foul pole and landed in the second deck. That made it 7-2 Yankees, and they turned to Aroldis Chapman to close it out, sealing their second-straight Wild Card Game victory. This was the first postseason victory as a manager for Aaron Boone, and he said of how close it came to hoe he would draw it up, "Yeah, pretty good. Pretty good. Seve set the tone and really came out on a mission. And I thought he threw the ball so well. Credit to the A's though. They made it tough on him. And they battled him and he was able to make some big pitches when he really needed to, but kind of really made him work hard to that point. "So and then Dellin, we wanted Dellin for that part of the order. So I was willing to go to him obviously as early as we were. And for him to go through and get us six big outs at that point. And then we were able to add on, which was nice. And, yeah, it rolled out pretty well." Q. How much going in was your game plan to have Seve throwing fastballs in the first inning and then switch to all speed stuff after that? AARON BOONE: That's him and (pitching coach) Larry (Rothchild) and the pitching plan and how we're going to attack. And Seve's -- Seve always does a good job, I think, of mixing his pitches. He'll work hard to establish his fastball. He's worked hard all year making changeup a factor. He didn't throw the changeup as much tonight as he has in a lot of outings this year, but he threw enough to be effective especially the second and third time through. You know going up against that lineup -- because they're patient and they're dangerous -- you've got to be able to mix those pitches and you've got to be able to throw strikes with all those pitches and he was able to do that. AARON BOONE: Not no matter what. Seve had an opportunity to get through those guys. And had he done that, you know had he gotten those first two guys out, we would have stuck with Seve there. But we're prepared, if a couple guys got on there and just because they were making them work so hard, we were prepared to go to Dellin if we felt it was necessary. And after the first two guys got on I believe that it felt like time. Q. I guess the other part of that then is just a guy that hasn't been in that situation, hasn't pitched that early in the game and coming in the middle of an inning like that, why do you feel that was? AARON BOONE: Because Dellin is a stud. I wanted him facing -- I told him before the game, you may be who I go to in the fourth or the fifth inning potentially, if it's a part of lineup that I want you facing in that spot. I just felt like he was the guy and so we got him ready for it and he came in and he was lights out. Q. So much went right for you guys tonight. How do you think this game kind of showed off all the different ways that you can win and the good things about your team right now? AARON BOONE: Yeah, no question. With Cutch leading things off with a -- working the walk, getting on base, I talked to you guys a lot about controlling the strike zone. Cutch does that so well. And Judgy with a big swing and, bam, all of a sudden it's 2-0. And Seve built some steam from there. And even though he wasn't able to get too deep into the game, he was good for while he was in there. And I credit the A's. They grinded him. They made it hard on him. And so Seve pitching that way, and then you see obviously the bullpen coming in and being as effective as they were, I think that's kind of a really good look at kind of when we're at our best right there. We did a lot of things well and then got some guys in there defensively that helped things. Hech with a great play down at third, walk to finish it off. It was nice. Q. You've seen the Red Sox this postseason. As a player. And you've seen it now as a manager during the regular season. What do you think about the guys in there, how they're going to respond to that setting and what do you think about the matchup? AARON BOONE: I think they can't wait. I think they're ready and relish the opportunity to go up against the games best this year. And obviously we're very familiar with them. We know how good they are. I mean, we know we have to play our best if we're going to have a chance to beat them. Obviously they're very tough at Fenway. But I think you say the same for them probably. But I know our guys can't wait to get there and try and get it done. Q. Obviously spent a lot of time focusing on the A's for this game. Now that you're passed them. Does part of you feel it was destined to help that you would play the Red Sox based on the way you've paralleled each other? AARON BOONE: I don't really go there and get caught up in we're destined. I mean, we know who the next opponent was and we know this is a one-game thing. And so you're confident you can get it done but at the end of the day it's still a win-or-go-home, one game, anything can happen. So you just prepare as best you can and pour everything into this one and now we'll obviously so focus on the Red Sox. Q. Gary had a huge night behind the plate. Can you speak a little bit of him managing the pitching staff, calling the game, blocking balls, everything that goes into it? AARON BOONE: He was great. He was a huge part of it. I thought him and Seve were on a great page together. I thought he received really well. Obviously the blocks, you talked about, behind there. I just thought his focus and just seeing him today when he came in, just love the look in his eye and his intent and his purpose. And everything -- was just proud of the way he was able to call it. And he was a big factor for us to be able to hold down a really good offense. Q. Obviously this is unique as a Wild Card game, how you handle the pitching, but going forward in the postseason could you see yourself generally with a shorter leash on starters, more creative use of the bullpen in ways if not in elimination game situations still different from what we saw from you in the regular season? AARON BOONE: Yeah, I think it's different. But also maybe a little different from a win-or-go-home kind of situation as well -- you know, and how much the guy threw the day before and how much do you really have out of individuals. That's just the fluid situation every single day. But, yeah, and I think it is certainly different than the regular season, with the aggression and you're willing to push guys and push certain relievers on a given night, yeah. But it changes a little bit every day.